100 Free Cartoon-Style Animal Vectors | Free Vector Graphics | All Free Web Resources for Designer - Web Design Hot! 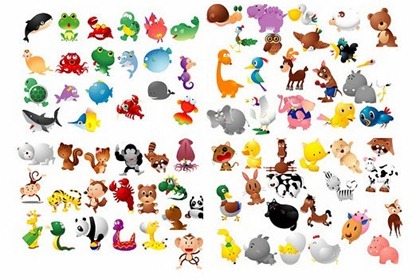 Here are 100 cartoon style animal vector graphic, includes a AI(Adobe Illustrator) file for your design. This entry was posted on Monday, July 20th, 2009 at 10:44 pm and is filed under Free Vector Graphics . You can follow any responses to this entry through the RSS 2.0 feed. You can leave a response, or trackback from your own site. I just want to know about the license of this animals set ? is it creative commons ? great collection! I’ve always been impressed with the selection on deviant art. So much talent! Im trying to create a kids app to be sold in the appstore. I would like to use the animal vectors in the application please let me know if this will be in breech of any liscence. If so how can I obtain permission to use it in my app. Nice blog, thanks for this info. great vectors, please let me know what i need to use them in ipad commercial app.